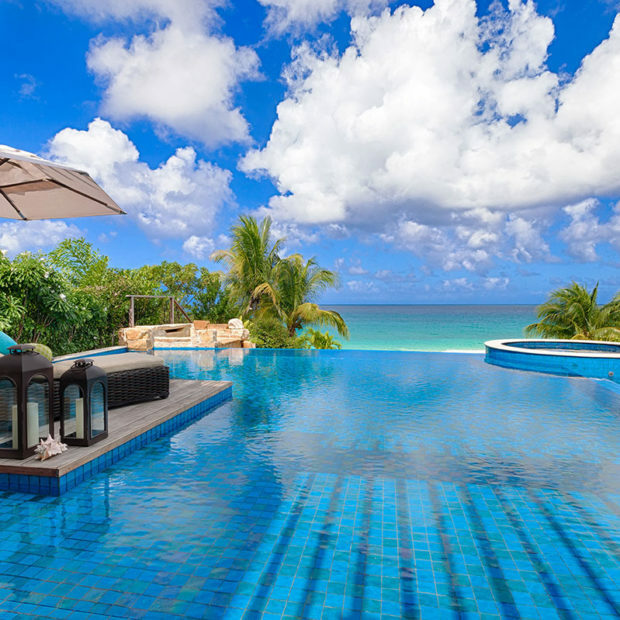 A vanishing edge swimming pool cascades into a lower plunge pool and with the adjacent hot tub enjoys panoramic ocean views. 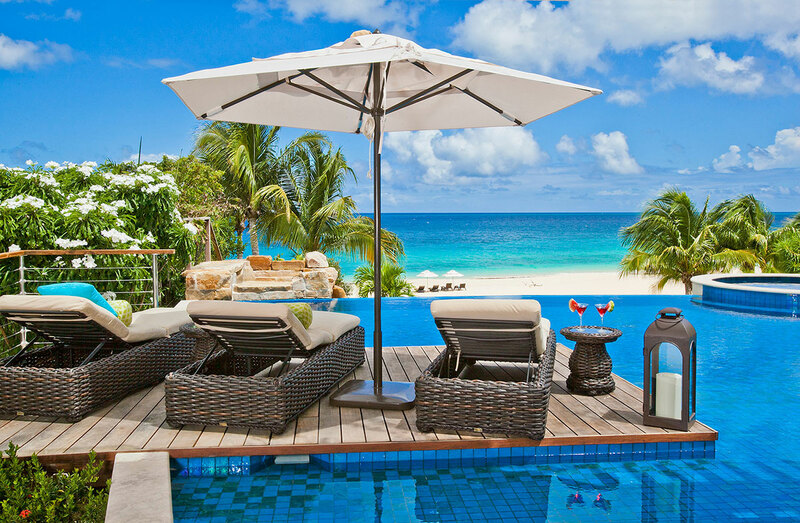 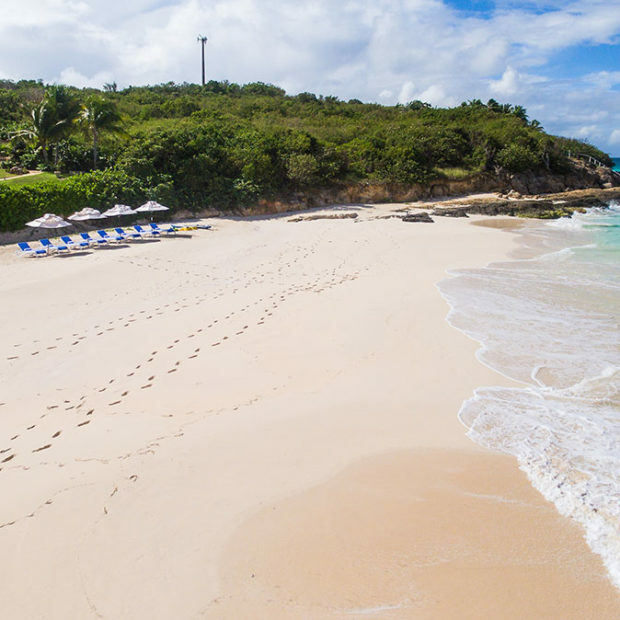 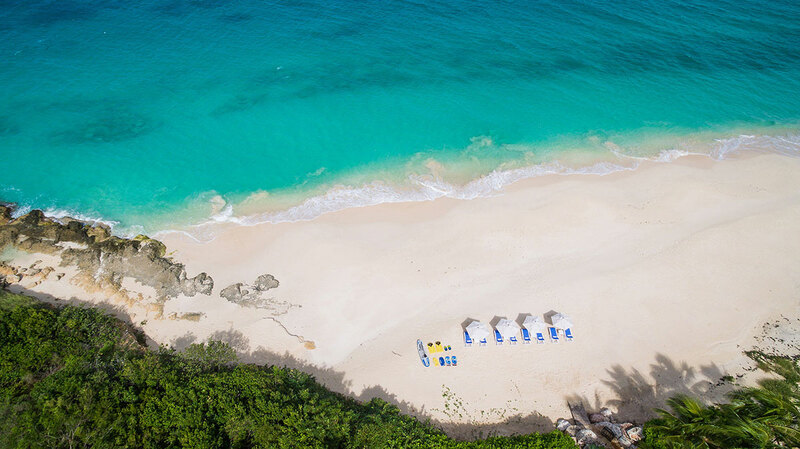 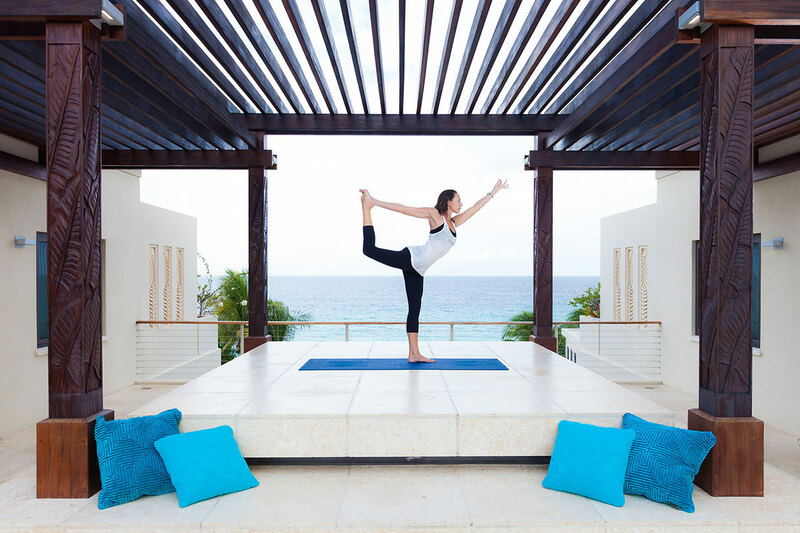 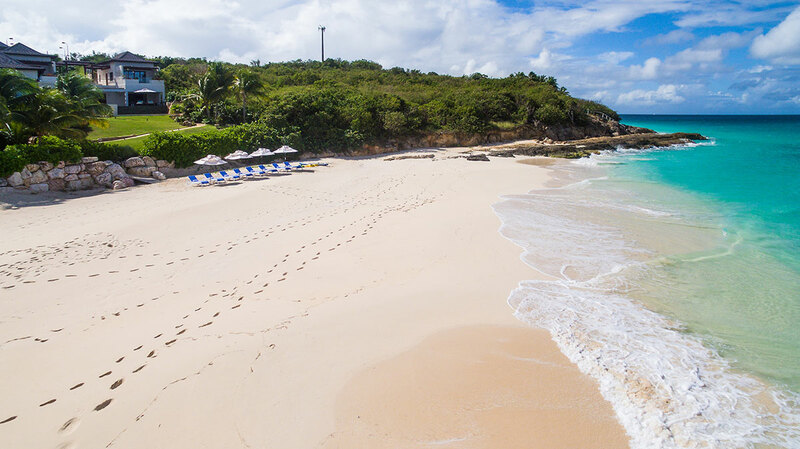 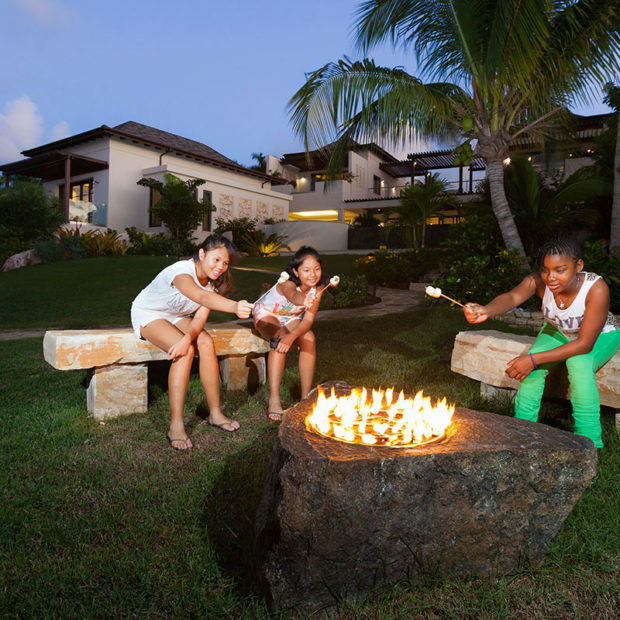 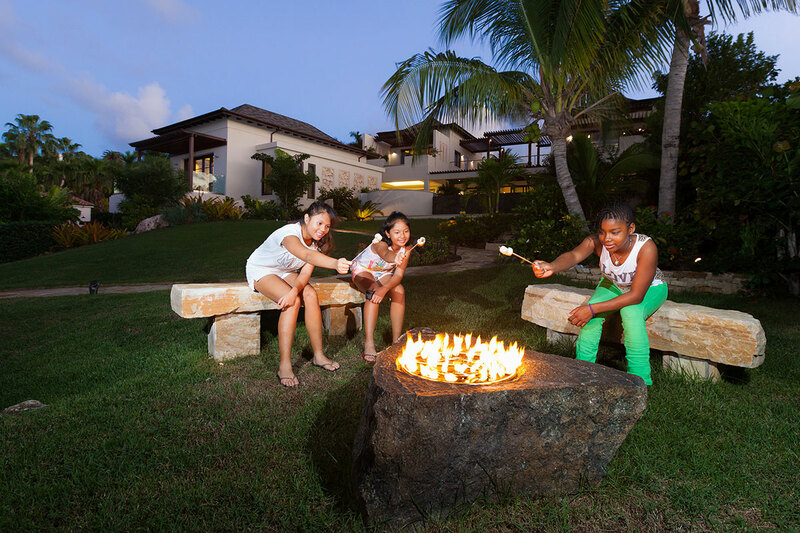 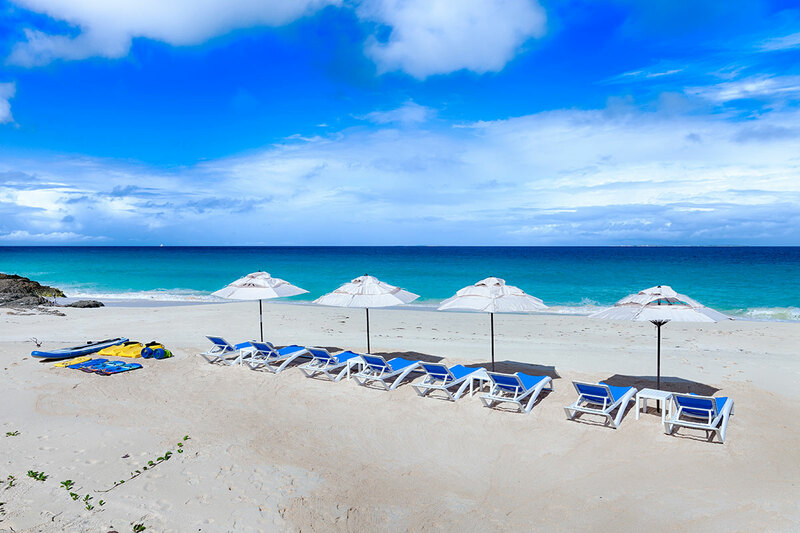 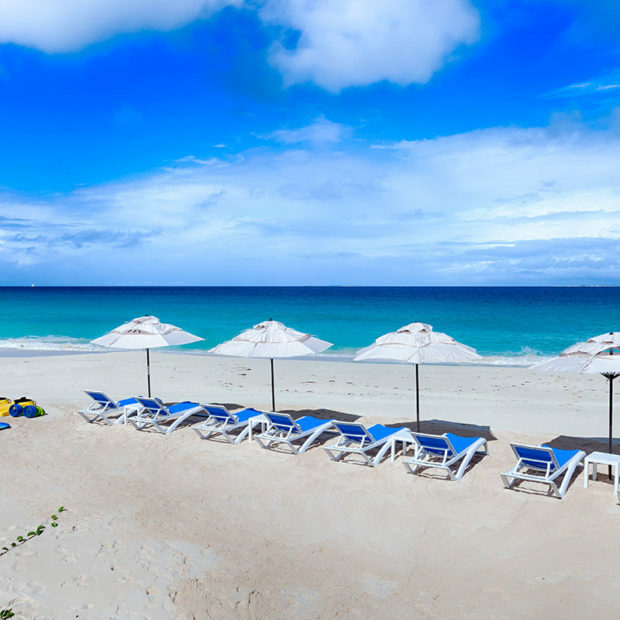 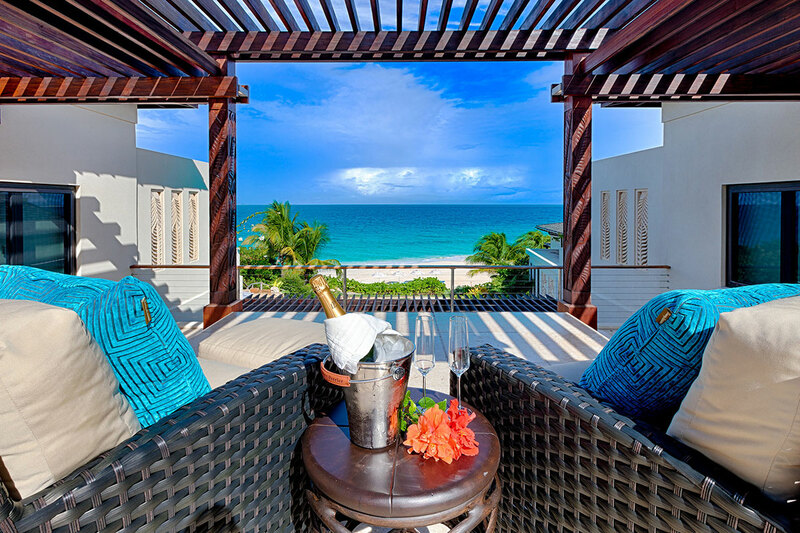 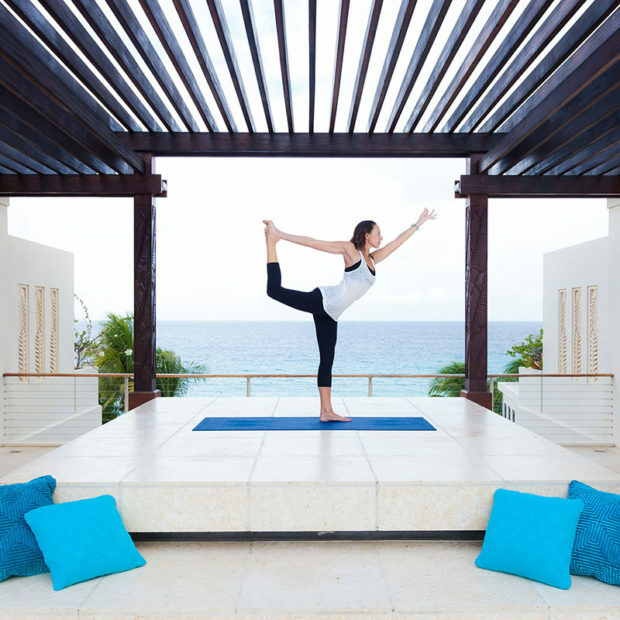 Nevaeh’s location is second to none with direct access to one of the most private and pristine beaches on Anguilla. 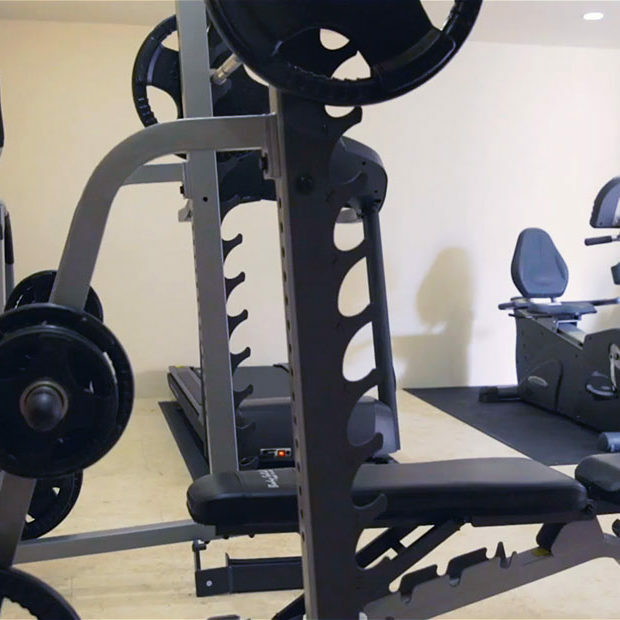 An array of recreational amenities are on offer including tennis, basketball, a golf simulator, private gym, home movie theatre, watersports equipment, beach volleyball, golf carts and more. 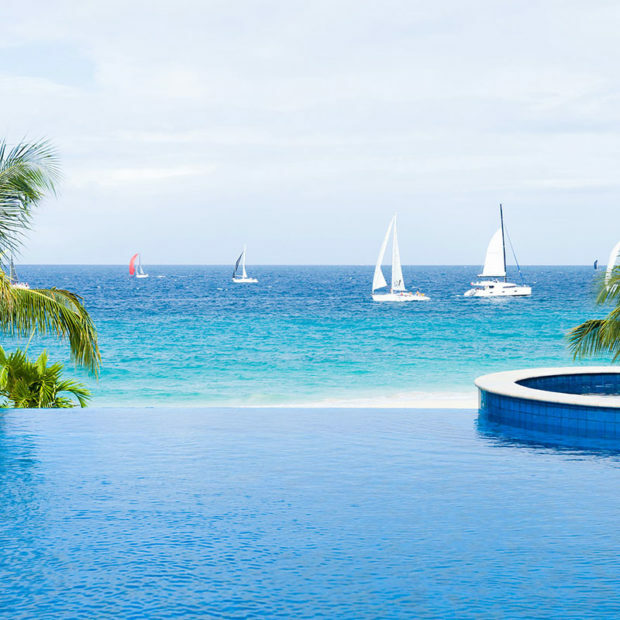 Hand-crafted aqua blue tiles line the swimming pool, creating reflections that perfectly mirror the ocean views. 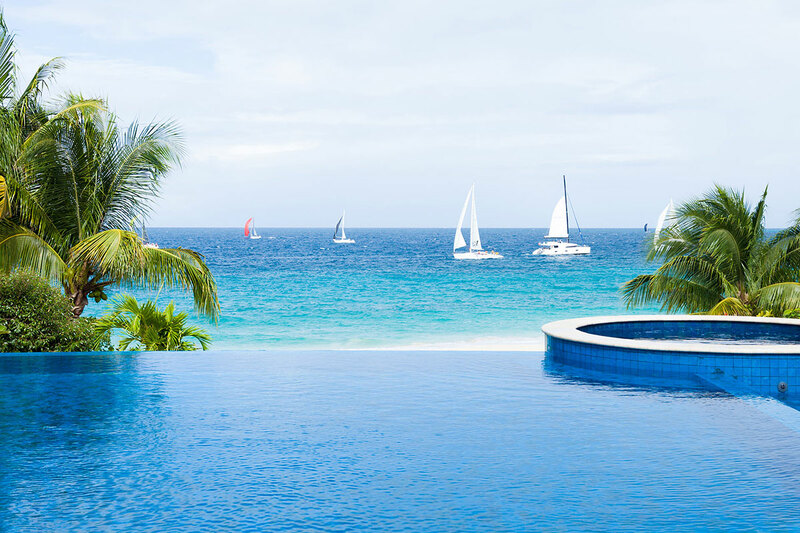 Featuring a sloped entry and splash area, the vanishing edge upper pool cascades into a lower plunge pool with a hidden grotto behind a waterfall, providing hours of aquatic fun and relaxation for guests of all ages. 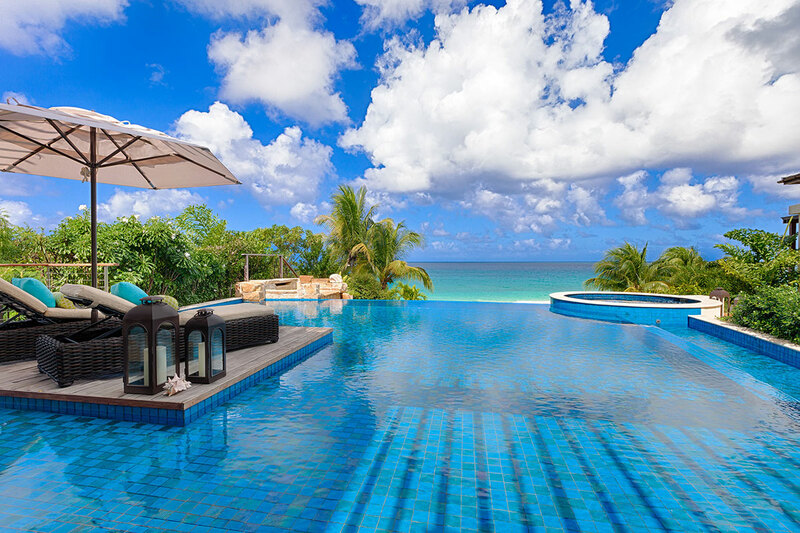 Mattresses and inflatable pool toys for children are available. 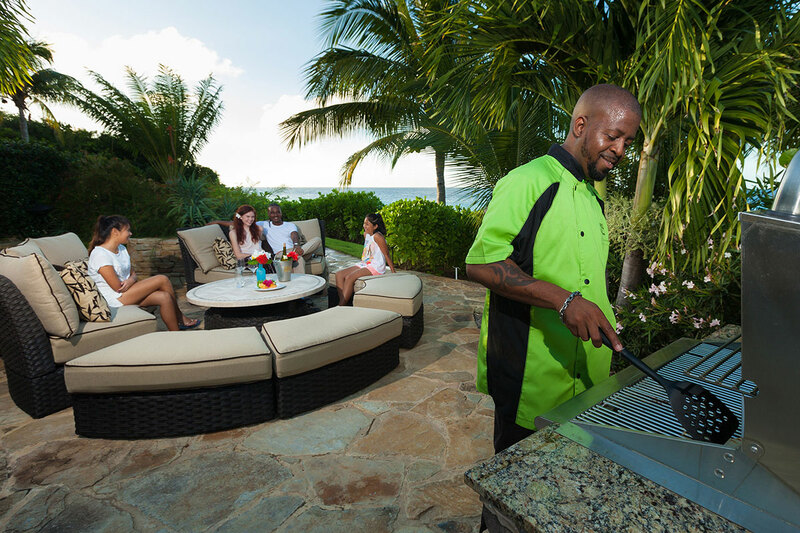 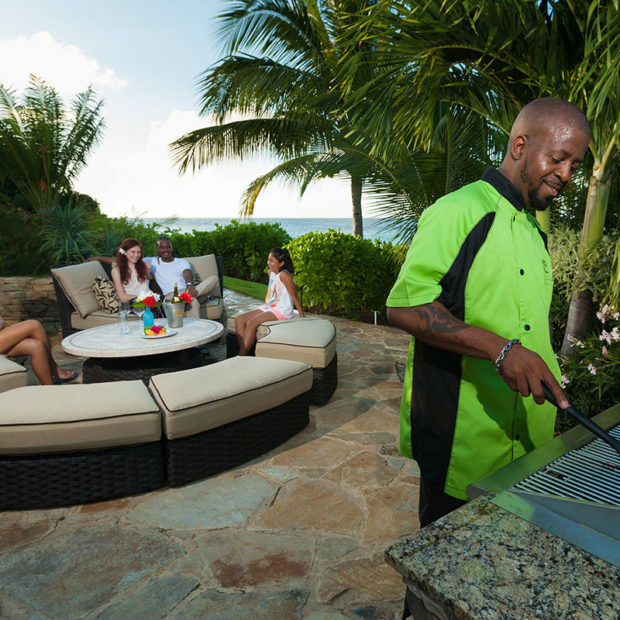 Access to the beach is by way of a gently sloped path that winds through the gardens, past the barbecue grotto and sunset deck. 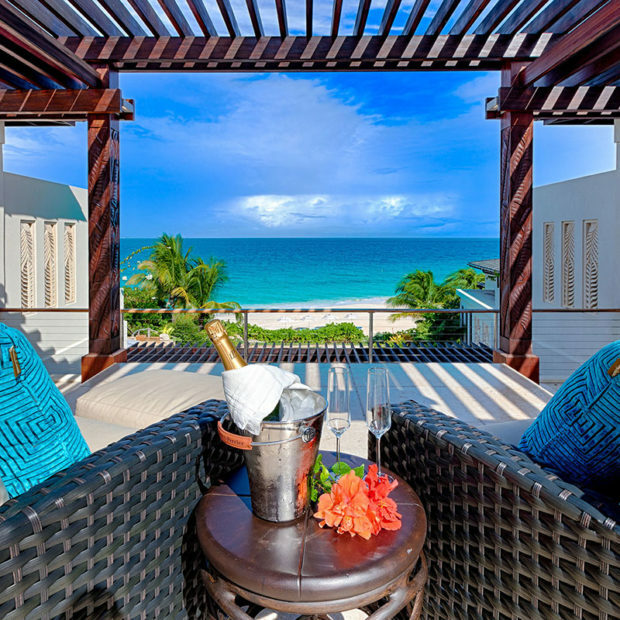 Beach loungers and umbrellas are set up for guests directly in front of the villa and staff are on hand to serve cool drinks and assist with watersports. 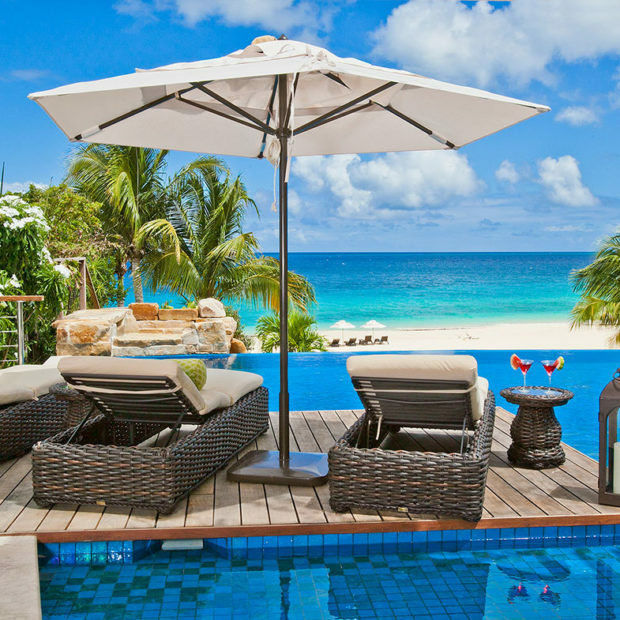 Equipment includes kayaks, stand-up paddle boards, sea scooters, sea sleds and snorkel gear. 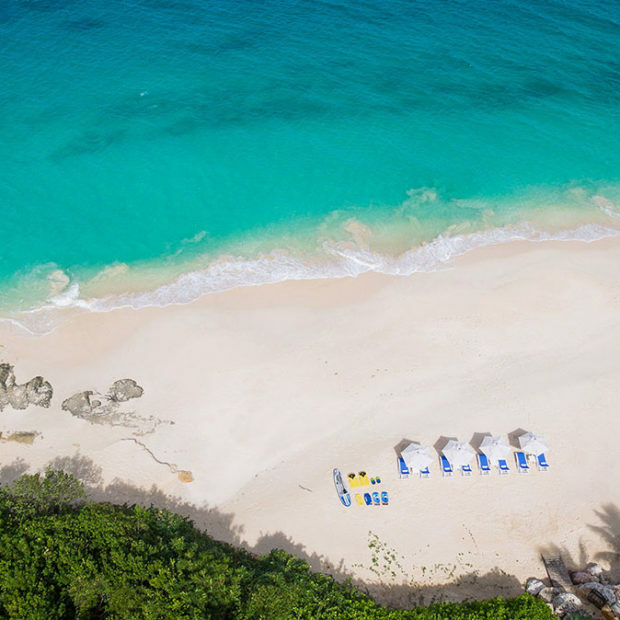 Life jackets are provided along with sand toys for young children. 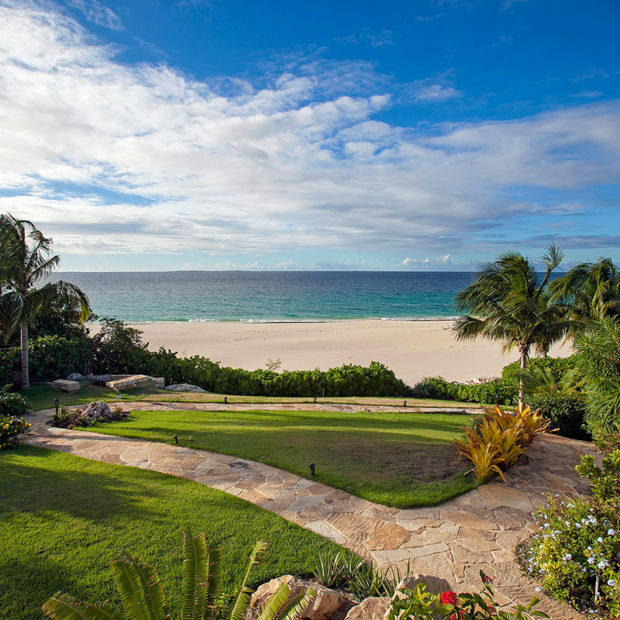 During the winter months, ground swells on occasion inhibit the use of watersports equipment. 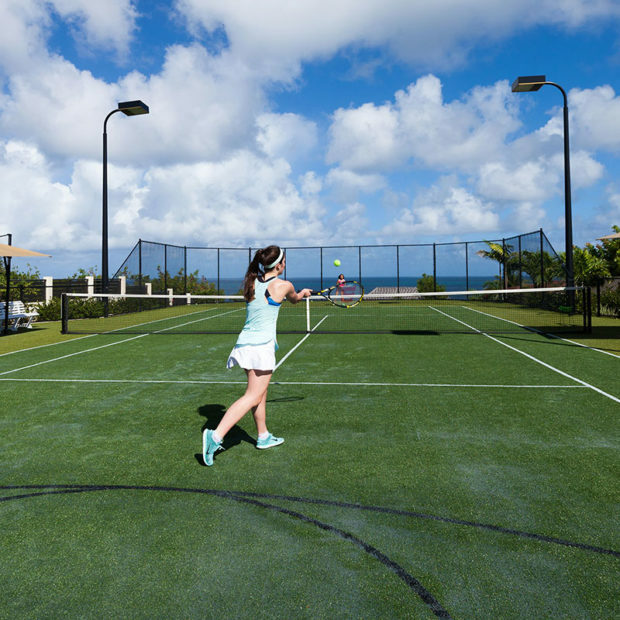 Located at the top of the estate, is a lighted Astroturf tennis court which doubles as a basketball half-court. 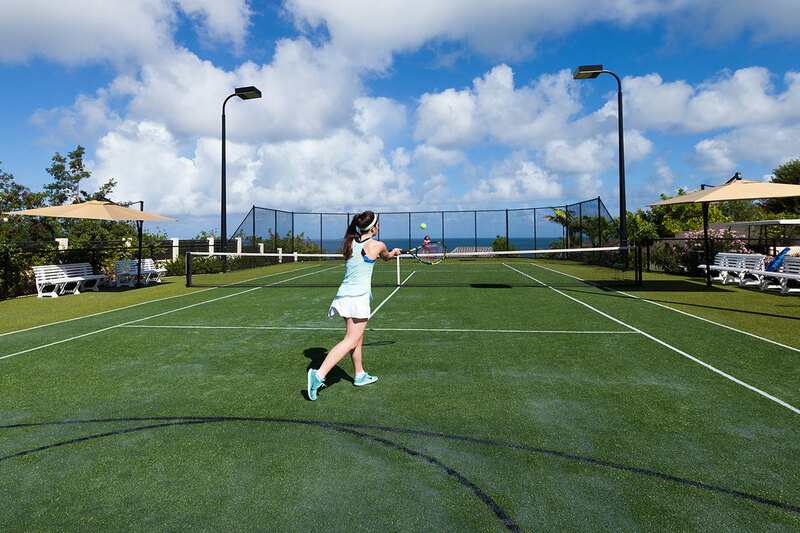 Rackets and balls are provided and a pro or hitting partner can be arranged. 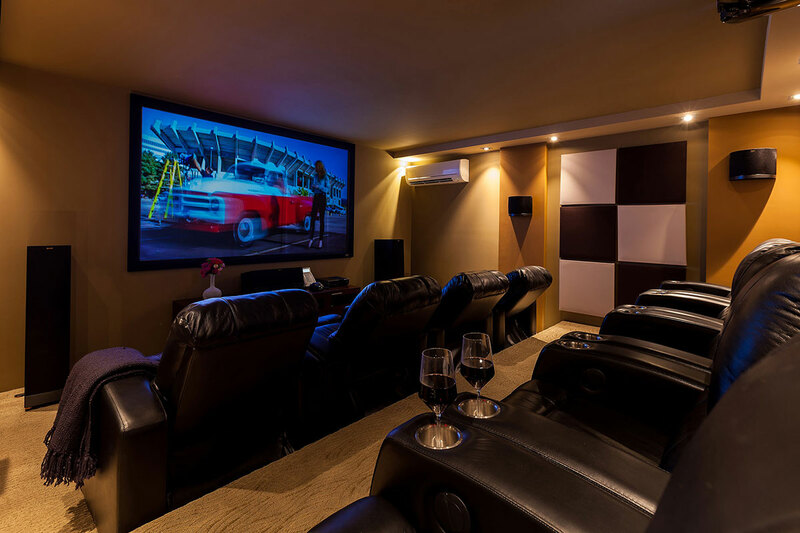 A home movie theatre with a 120" high definition black diamond screen, surround sound, DVD player and X-Box console is located on the ground floor of the Guest House. 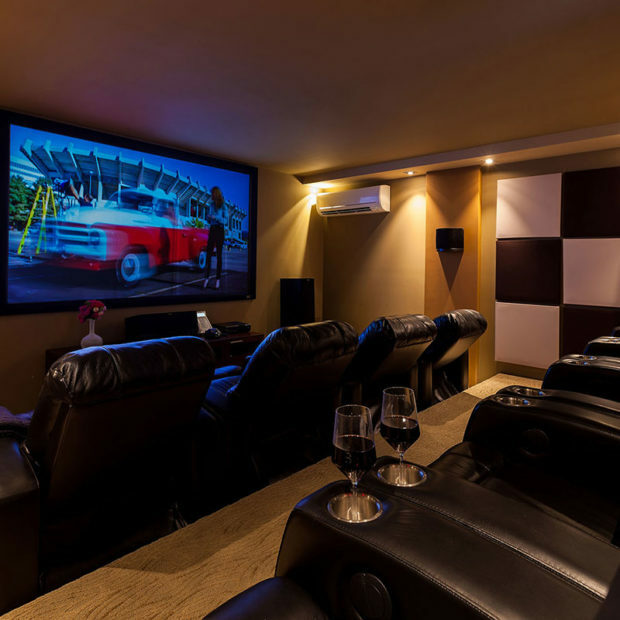 Featuring 9 reclining leather seats and with satellite tv and complimentary Netflix access, movies, sporting events or tv shows can be enjoyed on the big screen at any time of the day. 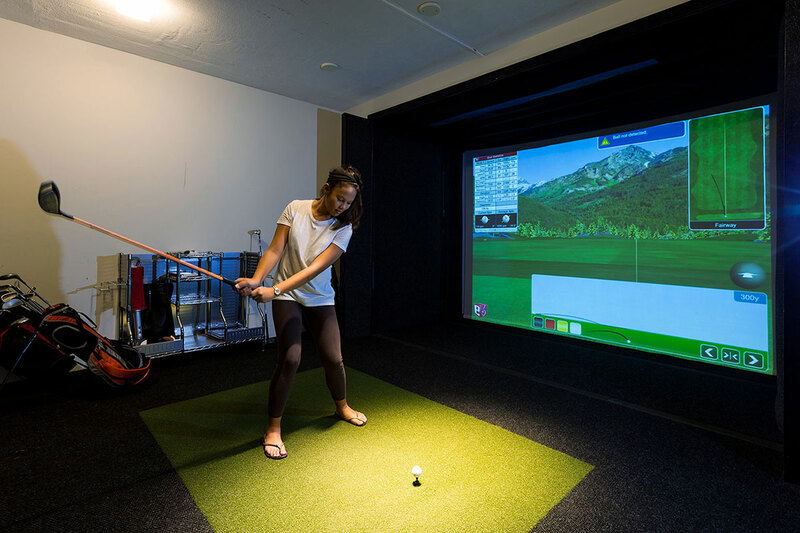 One of Neaveh's most unique amenities is a custom built golf simulator room, adjacent to the movie theatre. 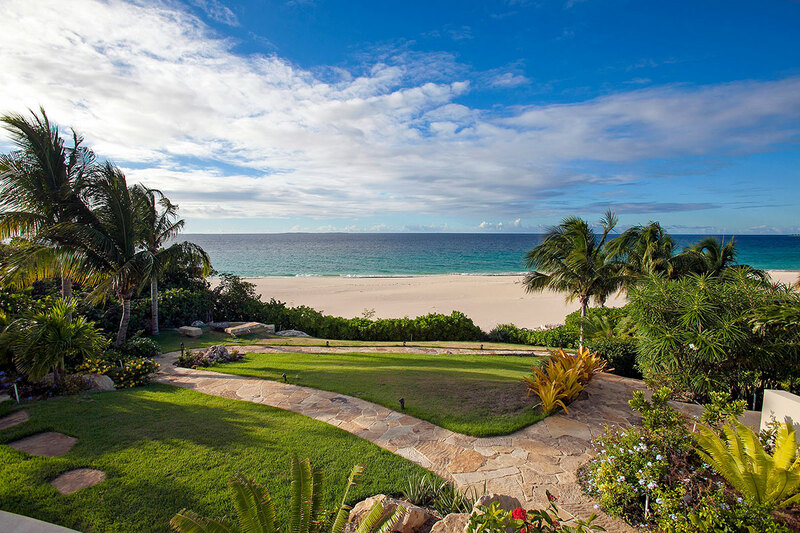 Guests can play on one of hundreds of golf courses from around the world. 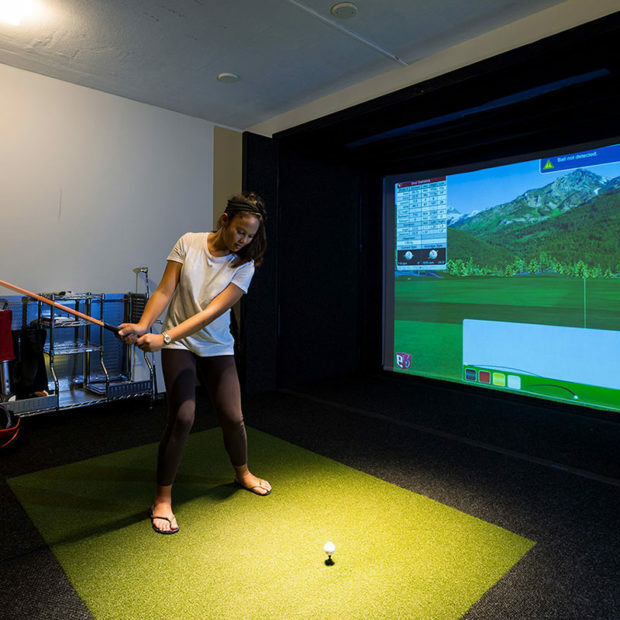 Clubs and balls are provided and after a warm up round at "Pebble Beach" guests can head out to the island's Greg Norman designed championship 18-hole golf course, a short drive from Nevaeh. 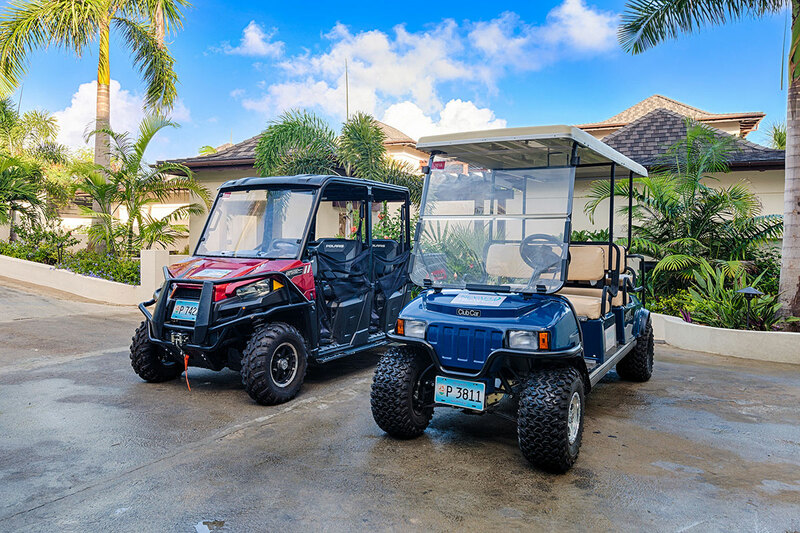 Nevaeh guests can avail of two 6-seater golf carts and a 4-seater Polaris Ranger UTV. 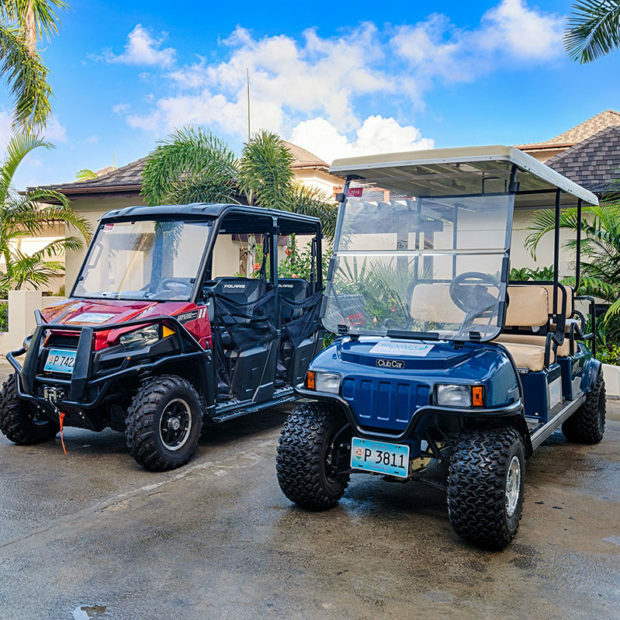 All vehicles are licensed to be driven on the road thus allowing guests to explore the nearby village as well as visit other beaches, restaurants and shops.